Direct Metal Laser Sintering (DMLS) is an additive metal fabrication (sintering) technology developed by EOS of Munich, Germany, often confused with the similar technical processes, selective laser sintering (SLS) or selective laser melting (SLM). 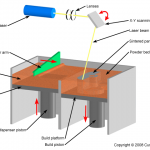 The process involves use of a 3D CAD model whereby a .stl file is created and sent to the machine’s software. A technician works with this 3D model to properly orient the geometry for part building and adds supports structure as appropriate. Once this "build file" has been completed, it is "sliced" into the layer thickness the machine will build in and downloaded to the DMLS machine allowing the build to begin. The process starts by slicing the 3D CAD file data into layers, usually from 20 to 100 micrometres thick, creating a 2D image of each layer. This file format is the industry standard .stl file used on most layer-based 3D printing or stereolithography technologies. The file is then loaded into a file preparation software package that assigns parameters, values and physical supports that allow the file to be interpreted and built by different types of additive manufacturing machines. The DMLS machine uses a high-powered 200 watt Yb-fiber optic laser. Inside the build chamber area, there is a material dispensing platform and a build platform along with a recoater blade used to move new powder over the build platform. The technology fuses metal powder into a solid part by melting it locally using the focused laser beam. Parts are built up additively layer by layer, typically using layers 20 micrometres thick. This process allows for highly complex geometries to be created directly from the 3D CAD data, fully automatically, in hours and without any tooling. DMLS is a net-shape process, producing parts with high accuracy and detail resolution, good surface quality and excellent mechanical properties.